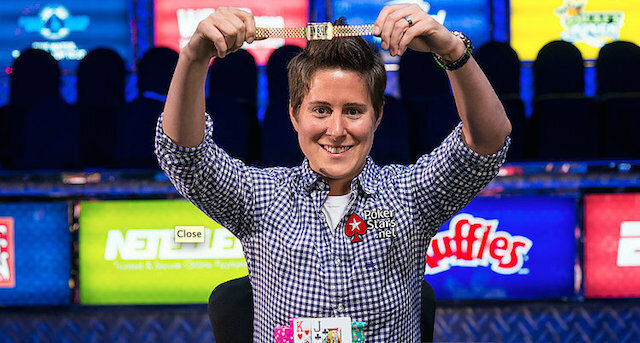 Vanessa Selbst won the ,000 Mixed Max No Limit event at the 2014 WSOP. The World Series of Poker 2018 schedule hit the presses this month with the usual rollout of acclaim and complaints. A record 78 events are on the calendar for next summer but as is the case most years, a few events have been omitted. The WSOP isn’t shy about trying new events out but there are some that were there in recent years that are glaring in absence. The number of Pot Limit Omaha events has increased in events each year at the WSOP. More four-card events are on the schedule than ever before with the PLO Giant and an online tournament among them. The mark missed, though, with keeping only a single six max tournament listed. The $3,000 Six Max PLO event first appeared in 2013, as a $5,000 event before moving to $3,000 in 2015. If Twitter is any indication, there is a demand for more Six Max and PLO events. The combination of the two makes sense and the $1,500 buy-in level would be the best place to put it. Building off the momentum of adding more PLO events to the itinerary, Big O feels like a natural addition. Big O is featured on both Dealers Choice events along with the $1,500 Mixed Omaha event and the $2,500 Mixed Big Bet tournament. Those three diverse player pools are comfortable enough with Big O for the WSOP to include it in five tournaments. The $2,500 price point would allow players looking to take a shot and incentivize high stakes mixed games players to head over to the Rio in search of a bracelet. Not every WSOP event needs to have a record field in order to be considered a “success” and the Big O format would prove that to be correct. It’s a game players love and would give the WSOP brass a good sweat at having a high powered final table. One edge the competing series at the Wynn and Venetianhave on the World Series is the availability of single-day tournaments. The issue with this is the WSOP being concerned about the “prestige” of the bracelet being tarnished by having a one-day event resulting in a ceremony and speech. The buy-in level for bracelet events falling to $365 reduces some of the shine that comes with winning so how would multiple single-day $1,000 turbos reduce it further? The turbos would bring in both recreational players and professionals who maybe busted early on a Day 2 or are looking for one last event before skipping town. It will likely never be added to the schedule but more turbos and single-day tournaments would be well attended and received by all player genres. Bounty tournaments have taken over a large part of the online tournament landscape. The recycling of money back into the poker economy can serve players and operators well if executed correctly. The WSOP could use more blood in their online events and any chance to maximize that edge is being missed this summer. Players enjoy bounty events provided the structure and buy-in are done properly. A $1,000 buy-in with a Progressive Bounty seems to fit here as well as a $565 standard bounty. Either way you slice it, with the number of Bounty tournaments currently listed, there is a glaring hole in not having one available online. The unique format of Mixed Max No Limit Hold’em tournaments hit the WSOP schedule for the first time in 2012 with a $5,000 buy-in event. The progression of nine-handed tables to six max all the way down to heads up for the final stage of made for a true test of a player’s skills in all realms of No Limit tournament play. The WSOP featured a $25,000 Mixed Max event to open the 2014 series and included a $1,500 buy-in event as well. Since then, the World Series has done away with the format preferring to use the space for a regular No Limit event. Experiments in No Limit tournaments have been liked by players in the past with the Four Max and Ante Only events well attended before both were eliminated after 2014. It appears the World Series is looking to have more “recreational friendly” events on the schedule but is missing a key demographic of players looking for an alternative to standard full-ring events.